To greet the new year, I have a gift for you today! I received a grill pan from Lagostina that I used for grilling shitake mushrooms, and you could win one just like it. Leave a comment on this post before noon CST on Friday January 6th with your email address so I can contact you, and you’ll be entered to win a Lagostina 11-inch Grill Pan. The winner will need to give a mailing address in the US to receive the pan. Like all the Lagostina cookware pieces, this grill pan is beautiful. It’s a good size for fitting on one burner and still having a lot of surface area for stovetop grilling. And, even though I got the pan a bit messy while grilling teriyaki marinated mushrooms, it was easy to clean and return to its sparkling appearance. For this dish, I turned to A Spoonful of Ginger: Irresistible, Health-Giving Recipes from Asian Kitchens by Nina Simonds. This isn’t the only grilling recipe in that book either. I also made the Spicy Grilled Squid with Warm Greens. Both are quick-cooking dishes that work well with a grill pan. I took a different approach for the grilled shitakes than what was suggested in the book. 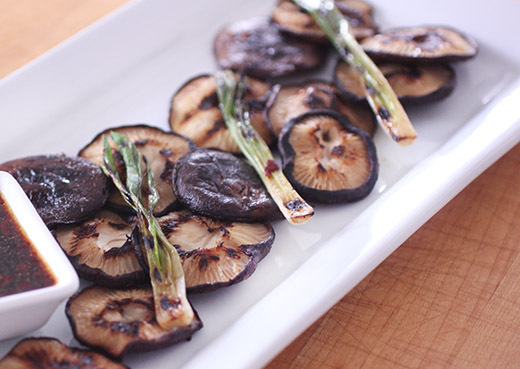 Rather than skewering the mushrooms and green onions, I set then on the grill pan flat. The Teriyaki Dressing was made by mixing one-half cup of soy sauce, one-third cup of white wine, three tablespoons water, two tablespoons of honey, a tablespoon of sesame oil, and two tablespoons of minced fresh ginger in a saucepan. I also added some crushed red chiles to give it some spice. The mixture was heated until boiling and stirred to dissolve the honey. 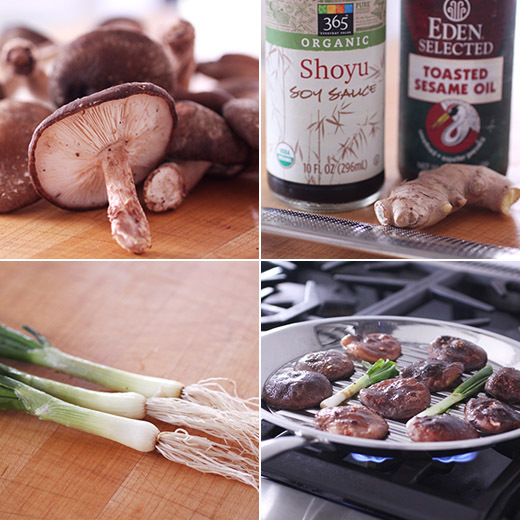 It was then brushed on the mushrooms and green onions, and some of it was reserved for dipping. The grill pan was heated over medium heat, and it was brushed with coconut oil. 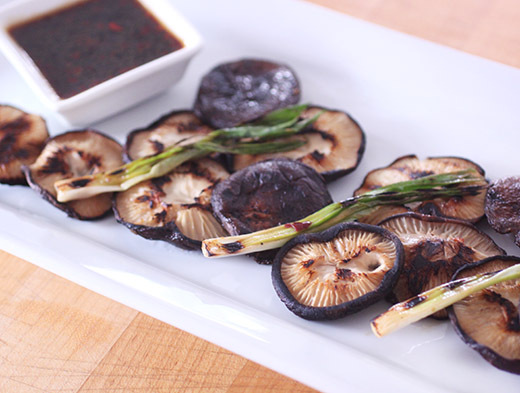 The mushrooms and green onions were grilled for a few minutes on each side until everything had good char marks and was tender. The grilled shitakes were a delightfully savory side dish with the squid and greens I served with them. And, the grill pan performed perfectly. I’ve been enjoying using the both the stewpot and grill pan I received from Lagostina. They’re both as pretty as they are functional. Good luck to everyone with the giveaway, and Happy New Year! At first glance, you might not think that the American South has much in common with southern India. But, Asha Gomez finds several intersections in food traditions, hospitality, and more from both regions in her new book My Two Souths: Blending the Flavors of India into a Southern Kitchen , and I received a review copy. She grew up in Kerala where the climate was also hot and humid, where rice is also a local crop, where there’s also an active coast line, and where “a talent for creating bounty out of an often modest pantry” is also common. She then spent fourteen years living in New York before getting married and moving to Georgia. Hosting supper clubs serving Keralan cuisine out her home in Georgia evolved into a restaurant business. Today, she operates a culinary event venue and an Indian patisserie. She continues to bring together the “resourcefulness and soulfulness” of both home regions in her cooking. The book includes dishes for breakfast, lunch, tea time, dinner, and desserts and sweets. The recipe for Puffy Ginger Hoecakes combines flavors of uttapam rice pancakes in these cornmeal cakes, and they’re served with a spicy syrup made with cumin seeds, coriander seeds, and red pepper flakes mixed into maple syrup. She tells the story of how the dish Country Captain traveled from India to the American South via a British sea captain. She interprets it with more of its Indian roots with spices and coconut and serves it with Carolina gold rice. Her Three Spice Carrot Cake is made with ground black pepper, clove powder, and cardamom and is topped with cream cheese frosting flecked with more of those same spices. I was very interested in the Onion Lentil Dumplings in Savory Buttermilk in which the lentil dumplings are served on top of a warm bowl of spiced buttermilk soup. Then, the Shrimp Pan Roast or Chemmen got my full attention. In both of Gomez’s south's she’s able to bring home freshly caught shellfish. 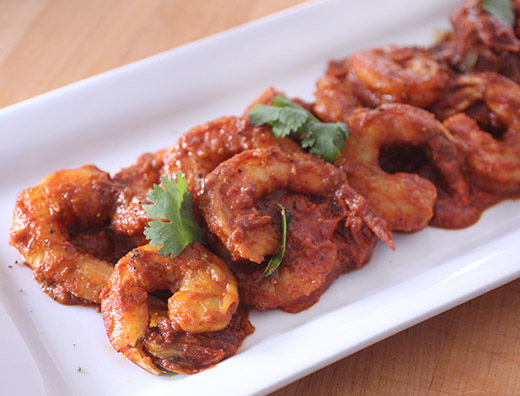 In Kerala, this would be made with fresh prawns, but here shrimp is more common. In addition to the fresh shrimp, dried shrimp is also used to amp up the flavor. In the past, a need to buy dried shrimp would send me across town on a food hunt. I’m delighted that now I can buy dried shrimp right in my neighborhood at a Korean grocery store. 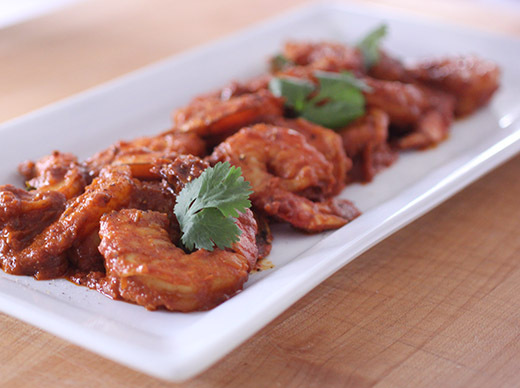 To begin this dish, the dried shrimp was combined with some freshly grated ginger and coconut milk in a blender and pureed into a smooth paste. Coconut oil was then heated in a large skillet. Minced shallots were added with fresh bay leaves. Once the shallots were browned, hot paprika and turmeric were added. Then, tomato paste, the dried shrimp paste, some salt, and a little water were added. The mixture was cooked for a few minutes. The fresh shrimp were then cooked gently in the sauce just until they began to curl. Because I always like to push the spiciness level a bit higher, I added a pinch or so of cayenne. 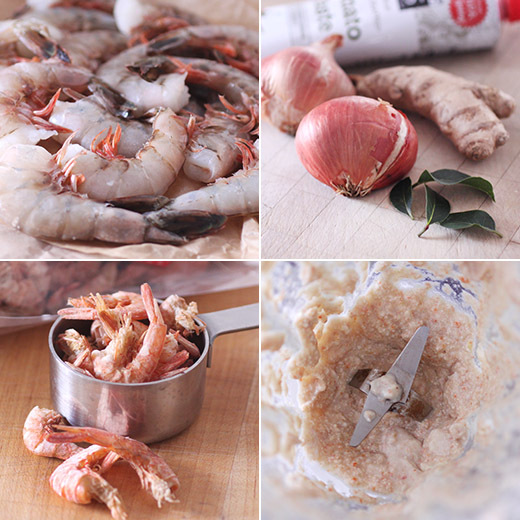 If you’re worried at all about using dried shrimp, you shouldn’t be. They add great, umami flavor but aren’t overpowering at all. The spices all come together deliciously here, and the tomato paste adds more umami and a hint of sweetness. It’s fascinating to read how two areas that are worlds apart actually have a lot in common, and it’s even better to eat the results of a combination of those two places. Happy Holidays, everyone! I always enjoy reading about Naomi Duguid’s fearless travels all around the world. Her latest book is Taste of Persia: A Cook's Travels Through Armenia, Azerbaijan, Georgia, Iran, and Kurdistan , and I received a review copy. She ventures into areas the casual tourist might not consider and brings back insights about the people, the culture, and the food. Her interactions with people and descriptions of places bring new understanding about areas that aren’t well-traveled by Westerners. For this book, her goal was to highlight the connections of the Persian culinary region that extends across current borders. The similar elements of this cuisine include “richly flavored bean dishes, flatbreads of many kinds, generous use of herbs and greens, plenty of cheese and yogurt, walnuts, inventive soups and stews, savory dishes flavored with pomegranates and/or other fruits, and rice as a beloved staple.” Each chapter presents a type of dish such as salads, soups, stuffed vegetables, fish, meat and poultry, rice and other grains, etc. And, each chapter includes recipes from all the Persian foodways regions. The sauces and spice blends at the beginning of the book piqued my curiosity. The green and red pepper pastes called ajika both sound delicious. As you page through the recipes, you’ll find short anecdotes about where and when Duguid experienced the dishes or how she learned the recipes. Kebabs were expected in the meat and poultry chapter, but it was interesting to find Turkey Kebabs from Azerbaijan. She writes that she had never seen kebabs made with turkey prior to finding them in Azerbaijan, and they’re very popular there. The turkey is marinated in vinegar with grated onion and sumac before being skewered and grilled. I can’t wait to try it. I also got a bit distracted reading about the cookies and sweets. The Apricot-Walnut Pastry is similar to rugalach, but the entire piece of dough is rolled up all at once after being spread with a mixture of walnuts, chopped dried apricots, and cardamom. Pieces are then cut and baked. But first, I tried the Walnut and Bean Pate. It’s made with kidney beans, and I had some in the freezer that I had received from my CSA. The beans needed to be cooked first, and since mine were fresh, although frozen, they didn’t take long to cook. 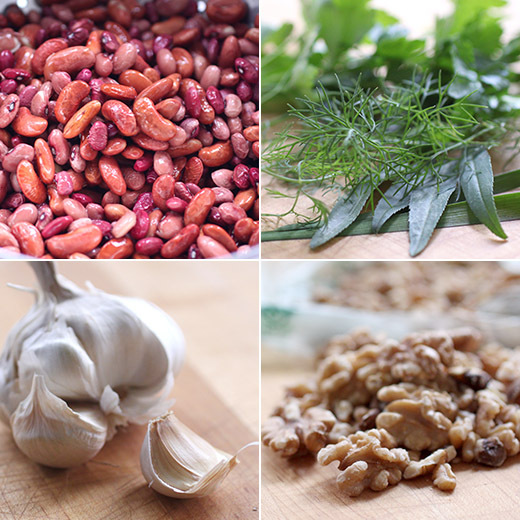 Next, walnuts were toasted and placed in a food processor along with chopped garlic and the drained beans. I added the olive oil, salt, pepper, and herbs and pulsed again. The mixture was transferred to a bowl to serve. I baked some chips from leftover pita to go with the pate. 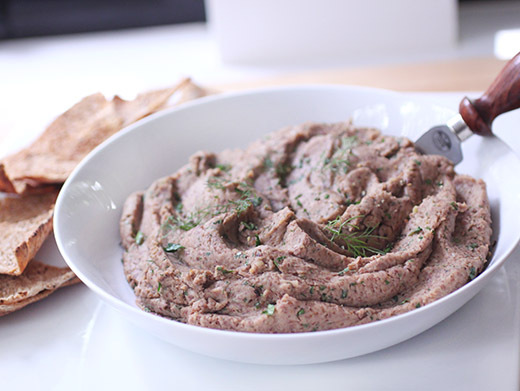 This is a sturdy spread rather than a more dippable snack like hummus. So, it’s handy to serve this with a spreader. The flavor is surprisingly rich given the simplicity of the recipe. It would be great as a sandwich spread too with some crumbled feta and maybe some pickles. There’s so much more to explore in this book, and as usual, this travel-food book has made me want to plan a trip. Excerpted from Taste of Persia: A Cook's Travels Through Armenia, Azerbaijan, Georgia, Iran, and Kurdistan by Naomi Duguid (Artisan Books). Copyright © 2016. Photographs by Gentl & Hyers. 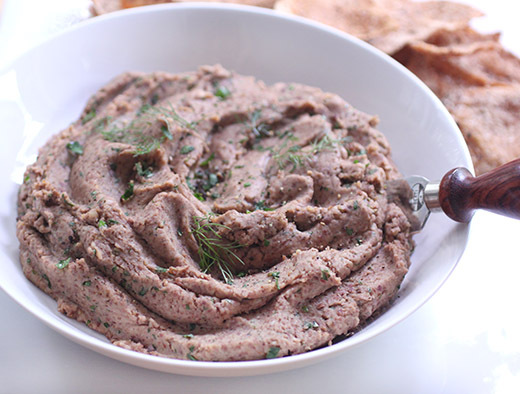 This lobahashu, a dish from the Lori region of Armenia, which borders on southeastern Georgia, blends finely ground walnuts into cooked mashed kidney beans. The result is a creamy, garlicky pate tinted pale pink by the beans. If you can, make it a day or even two days before you wish to serve it (and keep it in the refrigerator). The flavors deepen and blend remarkably over time. I like spreading this on bread or scooping it up with crackers. Guests love it and can’t get enough of it. Serve as an appetizer or a snack. I also like to put this out as part of a meal, another hit of flavor available on the table. Place the walnuts in a wide heavy skillet over medium heat and toast them, stirring them frequently so they don’t scorch, until aromatic, about 5 minutes. (The recipe I learned in Armenia did not include this toasting, but it assumed locally grown superb walnuts; the toasting helps bring out the flavor of the nuts.) Let cool for 10 minutes, then transfer them to a food processor and process to a fine texture. Add the garlic and beans and process to a smooth puree. Stop occasionally and scrape down the sides of the bowl to ensure that all the beans are incorporated. Turn the mixture out into a bowl, add the oil, salt, and pepper, and stir thoroughly. Stir in the herbs. Serve at room temperature. Refrigerate any leftover pâté in a well-sealed container for up to 5 days (though it is unlikely to last that long). Note: If you want to use canned beans instead of homemade, drain and rinse the beans, place in a pot with about 1⁄2 cup water, and bring to a boil. Simmer for 10 minutes or so. Check to see that the beans are tender. Let cool to room temperature, in their liquid, before using. Let’s take a quick trip to Sicily today. It’s the largest island in the Mediterranean, has been influenced by many cultures passing through and spending time over the centuries, and offers an immense variety of fresh produce and seafood. I was recently transported there while reading my review copy of Sicily: Recipes from an Italian island by Katie and Giancarlo Caldesi. The two of them operate two Italian restaurants and a cooking school in England. As they tasted their way around Sicily in hopes of finding some great, secret recipes, they repeatedly learned the “secret” for the best dishes was an obsession with the absolute freshness of the ingredients. The book’s chapters introduce you to Palermo and Its Street Food, Antipasti, Soups, Contorni, Pasta Rice and Couscous, Meat and Poultry, Fish, and Dolci and Cocktails. I had a hard time deciding what to make first. I was immediately curious about the Cauliflower in Red Wine in which parboiled cauliflower is sauteed with anchovies and garlic before the mixture is simmer with red wine and tomato paste. Next, I was pulled in by the Orange and Basil Risotto recipe involving zest and juice of an orange. Of course, there are several pasta dishes I want to try like the Sardine and Wild Fennel Sauce for spaghetti or busiate. But, in the end I decided on a soup so I could use a new stewpot I received from Lagostina. The pot is made for cooking polenta or minestrone with those words debossed on the lid, and it’s great-looking with the roundness of its shape and the curved handles. It comes with a wooden spoon for stirring and a metal ladle for serving, and the retail price is $199.95. Lagostina’s philosophy is to “attach the greatest importance to the aesthetic quality of our products because in Italy beauty is everywhere.” And, you could win one of these beauties! Just leave a comment on this post before 12/16/2016 when I’ll randomly pick one winner. To use this lovely stewpot, I decided to make the Broad Bean and Fennel Seed Soup. The broad beans, or fava beans, used here are in their dried form. I have a bag that I use from time to time for falafel. The beans have had their skins removed, and some are split. They need to be soaked overnight before beginning the soup. The soaked and drained beans were combined with a white onion cut in half, crushed fennel seeds, finely chopped celery, extra-virgin olive oil, water, and some white wine. The mixture was brought to a boil and then simmered until the beans were tender. Then, you have options to consider. You can serve a more brothy soup, or you can puree it, or you can puree some of it to thicken the soup slightly. Pureed cooked beans like this are sometimes served with sauteed greens. My choice was to puree some of the soup to thicken it and leave some of the beans whole and then top it with sauteed greens. It was also garnished with lemon zest, a drizzle of olive oil, and freshly ground black pepper. 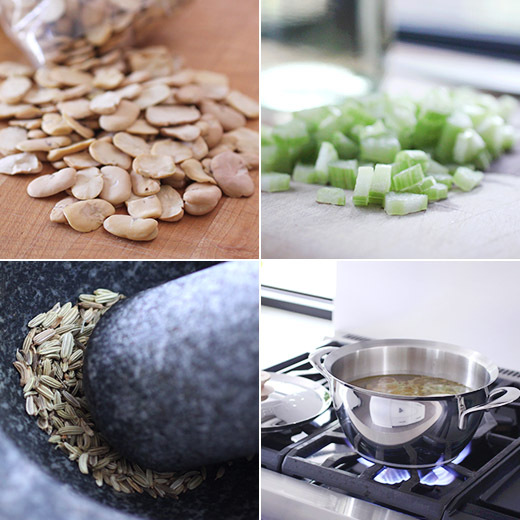 The beans provided a very mild base for the soup, and the fennel seeds and lemon added more decisive flavor. 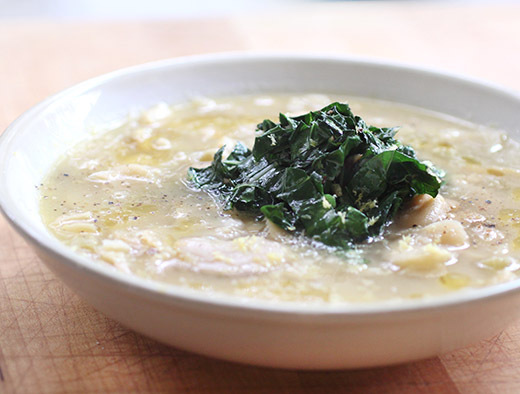 With the garlicky, sauteed greens on top, this was the right kind of soup for a chilly evening. Watching it simmer in that pretty pot made the experience even better. To be entered to win one just like it, leave a comment with your email address so I can contact you. The winner must provide a mailing address in the US. Good luck! Recipe reprinted with publisher’s permission from Sicily: Recipes from an Italian island . Dried broad (fava) beans have a distinctive, earthy flavour and a velvety texture unlike their former fresh selves. Do try them, I think the taste is perfectly lovely. In the south of Italy you can find a broad been purée probably introduced by the Romans, cooked from dried like this and served with the wilted green vegetable cicoria, another wonderful combination and easily reproduced with spinach. In Sicily, you will see the word maccu on menus all over the island; it comes from the word macare, to squash. Broad beans have been a staple of the peasant diet for centuries since they can be eaten fresh and raw in spring with young soft cheeses, boiled briefly through summer and dried for use in autumn and winter. In this case, dried broad beans are soaked overnight, then boiled and squashed to make a mash. If you use split broad beans they will have already been peeled and will take less time to cook. Leave it rough and ready like the ancient peasant soup that it was, or purée it for a sophisticated starter like our friend Marco Piraino, who showed me this recipe. He garnishes it with chopped samphire, drops of good olive oil and a little lemon zest. To make it more filling (it’s already pretty substantial! 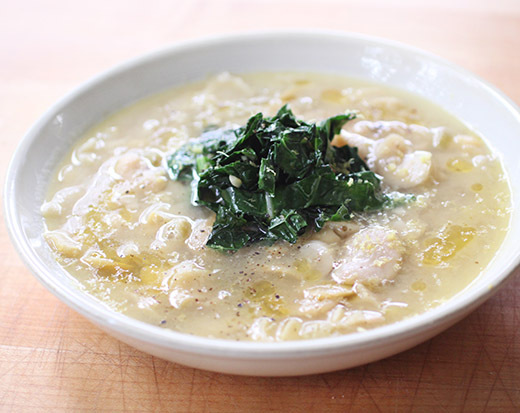 ), put toasted bread drizzled with olive oil into soup bowls and ladle the soup on top, or leave the soup a little rough and mix in some just-cooked short pasta. The maccu sets firm when cold and can be cut into slices, breaded and fried. Cover the beans in cold water and soak overnight. The following day, drain the beans and discard the water. Slip the beans from their skins if not already peeled. Put all the ingredients together in a medium saucepan and bring to the boil. Turn the heat to low and let the beans bubble away until they are tender and easily squashed, up to 2 hours, adding a little more water if necessary. Keep a couple of tablespoons of the whole beans to one side for garnish. Puree the soup as much or as little as you like with a stick blender. Pour into warm bowls and garnish with the reserved beans, a swirl of olive oil and the lemon zest or chopped samphire. Finish with a twist of black pepper. Variations: As a vegetable side dish: As the beans are cooking, don’t add extra water but let the mixture become thick. Puree the mixture to a rough or smooth texture and use it as you would mashed potato. In the south of Italy you will often see this served with garlicky sauteed spinach or chard leaves on top. For sliced maccu: After blending the soup pour it into a lined loaf tin and allow to cool. Put it into the fridge overnight and it will set firm. It can then be cut into 1.5 cm (1/2 in) slices and dipped in flour, egg and breadcrumbs and fried in hot oil until browned. Drain it on kitchen paper and serve straight away, dusted in a little salt. I thought I was fairly familiar with the styles of cuisine from different regions in the United States. I’ve read about Low Country and Southern foods and their differences and similarities. But, it wasn’t until I read my review copy of Victuals: An Appalachian Journey, with Recipes by Ronni Lundy that I was introduced to the foods of the Appalachian Mountain South. There was something familiar about the family recipes here. The use of home-grown vegetables, the mentions of the distinct flavors of fresh beans and just-dug potatoes, and the simplicity of the preparations reminded me of my grandparents’ cooking. I should mention, this is more than a cookbook. Ronnie Lundy grew up in eastern Kentucky and weaves the stories of this region with true understanding. The picturesque writing details the landscape along with the history of the towns and the people who have lived there. She writes: “I try to imagine what this journey was like on foot, as native people made it, and as many of the early settlers did, possessions stripped to not much more than tools for survival and seeds for planting. Switchbacks flanked by walls of rock and furiously rushing creeks are gorgeous, but equally perilous… I realize that while this was a passage of risk and hardship, it was also one of great possibility.” The book encourages travel as much as eating. She also writes of how things have changed over time and about some of the newly established restaurants in the area. The recipes represent traditional family fare as well as a few of the more recent restaurant dishes. There’s Shelley Cooper’s Speckled Butter Bean Cassoulet with Rabbit Confit from Dancing Bear Appalachian Bistro in Townsend, Tennessee alongside all the recipes for “the absolute best summer supper” including Mountain Green Beans and Taters, Skillet Corn, sliced tomatoes, and Buttermilk Cucumber Salad. You’ll also find Skillet Fried Chicken and Milk Gravy, Fried Apples, Buttermilk Brown Sugar Pie, and Colin Perry’s Sorghum and Apple Sticky Pudding. All the recipes come with a story and a place in time in this pocket of the country. Now that our weather has cooled off, I was ready for a good, comfort food kind of dish that makes use of fresh greens. I brought home a pretty bunch of kale from Boggy Creek Farm to make the Kale Potato Cakes. Yukon Golds were peeled, quartered, and boiled until tender. Meanwhile, the kale was washed, stemmed, and chopped. The kale was sauted in olive oil until wilted. 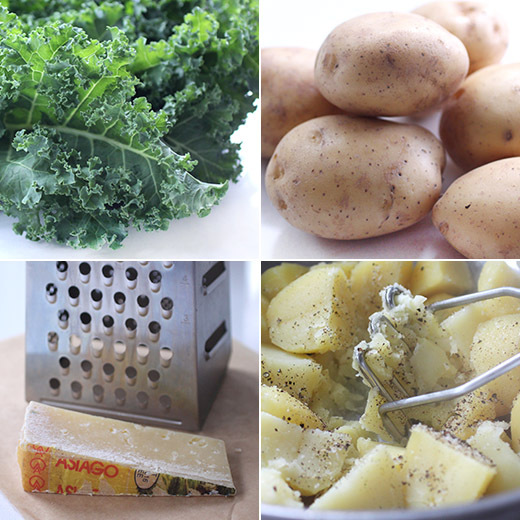 The drained potatoes were mashed a bit before the cooked kale was added. Chopped green onions were added as was shredded Asiago cheese. Four beaten eggs were then mixed into the mashed potatoes. The mixture was formed into three-inch patties that were crisped on both sides in hot olive oil in a skillet. 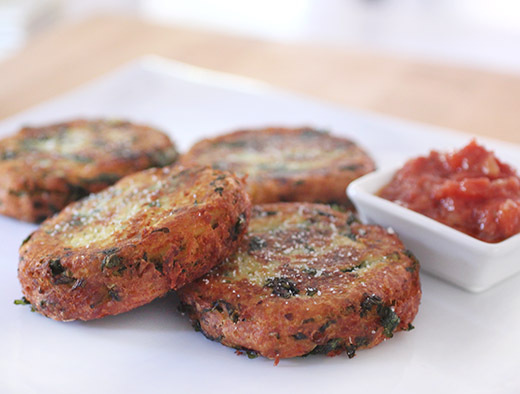 The potato cakes were served with Old-School Tomato Gravy made with sauteed onion, flour for thickening, and canned diced tomatoes. 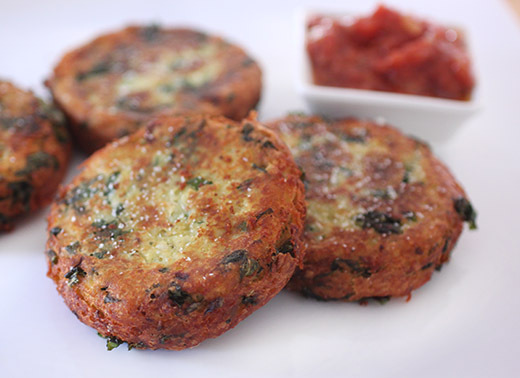 The crispy potato cake edges give way to tender, fluffy interiors, and the Asiago cheese flavors them well. The tomato gravy was delicious with them, but they were also perfectly lovely with no sauce at all. I’m inspired to find my way to this area of the country and drive along the mountain roads described in the book. I want to find the artisanal salts being made from newly revived salt mines and taste some of the many varieties of apples that grow there. Then, I want to bring home some sorghum syrup and make that Sticky Pudding.